Luxury consumers are changing. Their needs and expectations are seen to be at odds with the conventional understanding of what luxury goods are. The new luxury consumer is, more often than not, perceived to be anyone who falls into a younger generation. Millennials (aged 23-36) are now well into their careers and are reaching their peak spending age. Generation Z (aged 16-22), although much younger, are also appearing on the radar of the luxury market, the older cohorts of which are just entering the workforce. Both of these generations grew up in the digital era. Both are trendsetting generations at the forefront of fashion. Both are reimagining the value of certain goods and services in light of new forms of consumerism, and both are redefining the brand-consumer relationship. All this has clear ramifications on how the luxury industry chooses to align itself with the values of younger generations – a market which has traditionally relied on a sense of ostentatiousness and exuberance. So who is today’s luxury buyer? How are their attitudes changing towards the luxury goods market? And what does this mean for brands targeting the new luxury consumers? Male millennials are big spenders. 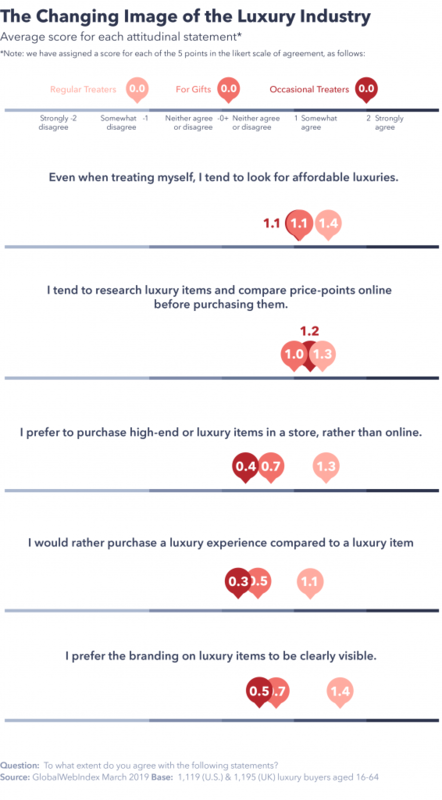 In our research, we segmented luxury buyers by frequency and purpose of luxury purchases. One of the most striking results of this was the age breakouts of each of the segments. Among those who regularly purchase luxury items for themselves, we immediately see the impact of lifestage: 25-44s make up the lion’s share (67%) of this audience. This is a reflection of the fact that millennials (aged 23-36) are firmly within this age bracket, and are now able to flex their growing spending power as many are progressing in their careers before starting families. Interestingly, we see a pronounced skew towards males among this segment too (67%). Among those who primarily purchase luxury items for gifts or special occasions, Generation Z and millennials emerge as the primary demographic; a third fall into the 16-24 age bracket, and just under a quarter into the 25-34 group. Males also take a significant share of this audience, at 62%. Less frequent buyers of luxury goods, and those who never do, include more older age groups and females. In fact, focusing on the 55-64 age group specifically, representation rises proportionately between occasional buyers, those who rarely purchase luxury items, and those who don’t do this at all. New luxury consumers enjoy experiences and travelling. “Luxury” is a term often associated with items like handbags or jewelry. But it’s come to take on a new meaning, particularly among younger audiences. 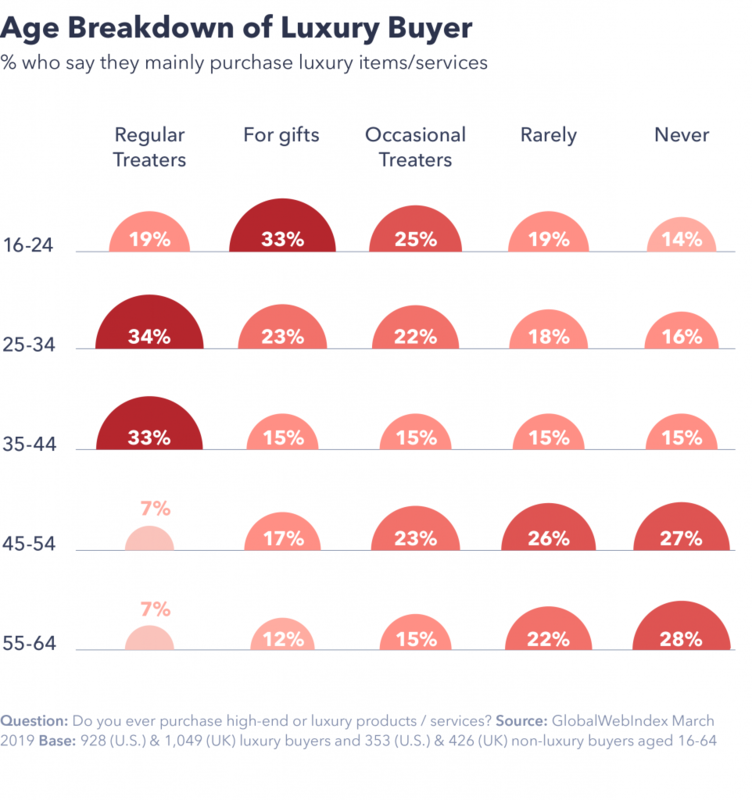 While younger audiences, especially millennials, display a slightly more unconventional view of what “luxury” stands for, our data shows that “new luxury” is most apparent among the different buyer types. These differences shine through when looking at luxury spending by category. Regular treaters are much more likely to have made a purchase across all the categories we track in the past 12 months. But compared to the average luxury buyer, it’s travel, household items and particularly automotive products that this segment stands out for. They’re also much more likely to have purchased an experience in the past 12 months: 3 in 10 have done so. 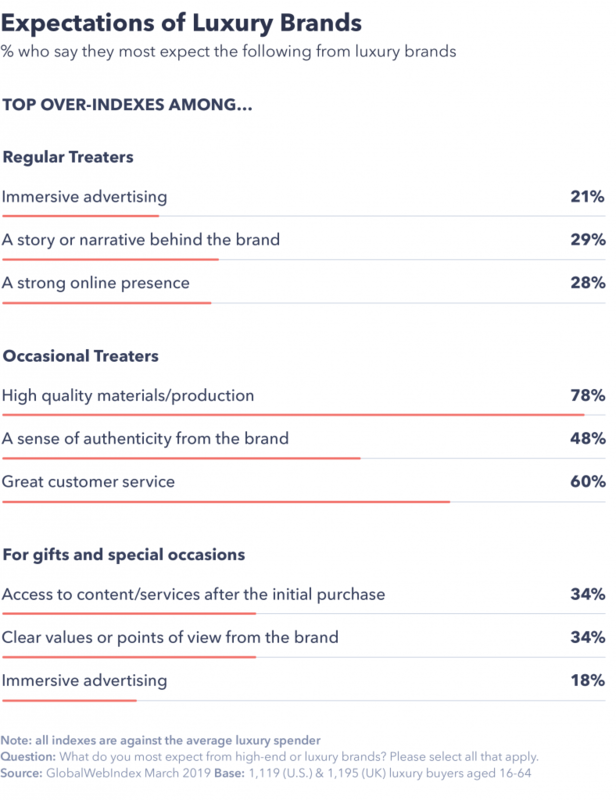 For these regular treaters, branded luxury buying retains its importance, but their enthusiasm for experiences and travel in their purchasing mindsets indicates a high value is placed on status and uniqueness. If luxury spending is ostentatious by nature, then it’s not difficult to see why experiences have struck such a chord. 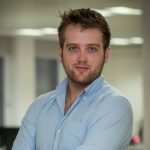 As social media sharing has moved from personal statuses to elaborate videos and photos showcasing lifestyles and building personal brands, experiences have emerged as an important way of communicating this; whether that’s through travel, exuberant services or food. For those purchasing luxury goods as gifts or for special occasions, less frequent luxury spending equates to a more selective mindset on which categories they’re willing to splash out on. Conventional luxury items like handbags, cosmetics and clothing form the basis of their luxury spending portfolio, but the more everyday items, like household products or cars/automotive products barely factor into their spending in the category. That makes their high over-indexes for experiences and travel all the more telling. Essentially, experiences represent unforgettable or unique occasions for this segment – no doubt a reflection of their much younger age profile and hence their above-average engagement with lifestyle-focused social platforms like Instagram. For the occasional treaters, the impact of less frequent luxury spending on which categories they’re willing to splash out on is even more polarizing. For these consumers, “luxury” means branded items, with the only category relating to sensory experiences for which they’re ahead of the average luxury buyer being food ingredients. This is perhaps a reflection of the accessibility luxury food items offer into the category. Affordable luxury is making an entrance. To understand why and how the luxury market is changing, we need to understand in which areas “luxury” has evolved from its most traditional sense; glitz, overt, out-of-reach and “high-touch”. From our attitudinal data, we can see how outlooks are moving away from these core principles, particularly among the regular treaters. Affordable luxury may seem like an oxymoron. But it’s one that has been making a serious impact on the go-to-market strategies of many luxury brands. In fact, it’s in purchasing luxury goods or services with an eye on affordability that we see the highest agreement levels among all three segments. Regular and occasional treaters in particular have a stronger inclination to look online to compare prices on luxury items. Being a “high-touch” category, in-store shopping has long been at the core of luxury spending, particularly due to the level of investment in the product or service. But it’s only among regular treaters that we see a pronounced agreement score for preferring to shop for luxury goods in-store. For the other two segments, average scores are much closer to the neutral mark. The same is true for preferring luxury branding to be clearly visible, with regular treaters having a much stronger sentiment towards ostentatious branding. Expectations of luxury brands are changing. With new ideas on the definition of luxury goods and services comes new expectations of luxury brands. Looking towards our occasional treater segment, we see that at the core of their expectations sit a very traditional set of values. 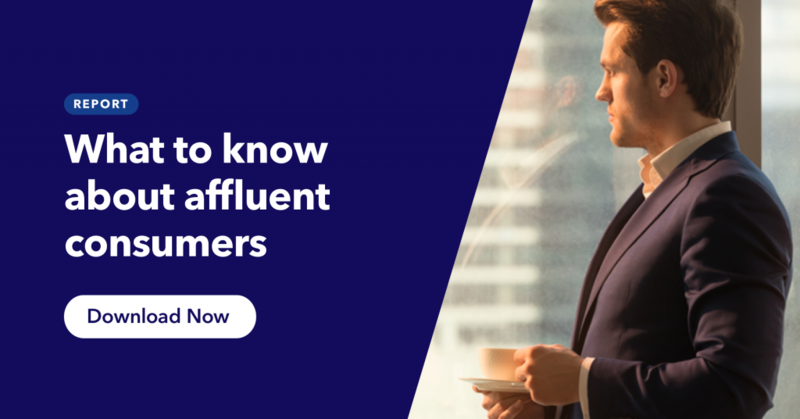 Similar to less frequent luxury purchasing resulting in a more limited set of categories they’re willing to splash out on; they’re also more inclined to ensure their money goes a long way. Occasional treaters see their highest over-indexes for expecting high-quality materials, a sense of authenticity and great customer services. The older age profile of this audience also increases their likelihood of desiring these more traditional qualities. For our other two segments, there’s a much more pronounced expectation of value beyond the purchase, and of the role brands must play in invoking touchpoints for these audiences to relate to. Stories and narratives are a key touchpoint here, and relate heavily to the desire for immersive advertising for luxury goods. Clear values attached to a brand reflect the growing pressure on companies inside and outside of the luxury category to lay bare their corporate social responsibility credentials. The high over-indexes we see elsewhere for locally-sourced materials and clear information on supply chains also tie into this. These expectations, along with changing attitudes towards luxury spending, signifies the need for luxury brands to move out of their comfort zones and challenge the core principles long associated with the exclusivity of luxury fashion. But diversifying out of the brick and mortar stores, moving online and embracing accessibility doesn’t necessarily mean ditching the core principles of luxury. It means adapting them. 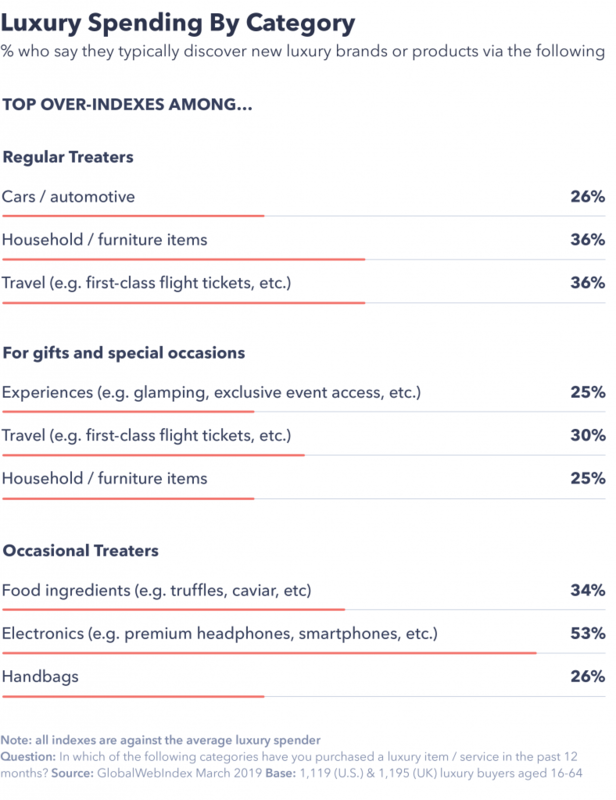 Around half of the regular and occasional treaters think having something unique and exclusive is important in their luxury spending. Tellingly, more than a third also expect brands to give them the chance to personalize products. With demand for personalization ramping up in almost every consumer category, from fast food to luxury, luxury brands can still retain their high-end image in a way that maximizes exclusivity on an individual level – not just at an expense level.